We recently spotted the Huawei Y7 Pro (2019) in a local store with a sub-PHP10K price tag. It has a large screen, dual-rear cameras, and a large battery. There’s another smartphone out there though, that also packs competitive specs at the same price, the Honor 10 Lite. Let’s find out which phone looks better on paper in this specs comparison. Looks like the Honor 10 Lite has dominated the Huawei Y7 Pro (2019) in almost all aspects, but the latter has its own notable features particularly the significantly large battery which makes more attractive to heavy users. Yes it has a slightly large screen size on paper but the 0.05 mm difference is negligible. The Honor 10 Lite will give you a better viewing experience with its Full HD+ resolution. Moving forward, it’s the Honor 10 Lite all the way. You will get higher resolution selfies, although we can’t discuss quality yet. It also has support for WiFi 802.11 ac, has a fingerprint scanner, and runs on EMUI 9 based on Android 9.0 Pie. If storage is an issue, there’s a 64GB model for PHP 1,000 more. When it comes to performance, the Huawei Y7 Pro (2019) is powered by a Snapdragon 450 (14nm) while the Honor 10 Lite has a Kirin 710 (12nm). We’re yet to benchmark both devices, but we can get an idea about its performance by looking at other devices the sport similar chipsets. For the Snapdragon 450, we have the Realme C1 and it got a score of 72,601. For the Kirin 710, we have the Huawei Nova 3i and it got a score of 138,548. Based on the numbers, that’s a huge performance difference. We’ll know more once we have fully reviewed the Huawei Y7 Pro (2019). The Huawei Y7 Pro (2019) and the Honor 10 Lite (3GB + 32GB) are priced at PHP 9,990. If you’re looking for the best performance, get the latter, but if you’re after the big battery, then get the former. 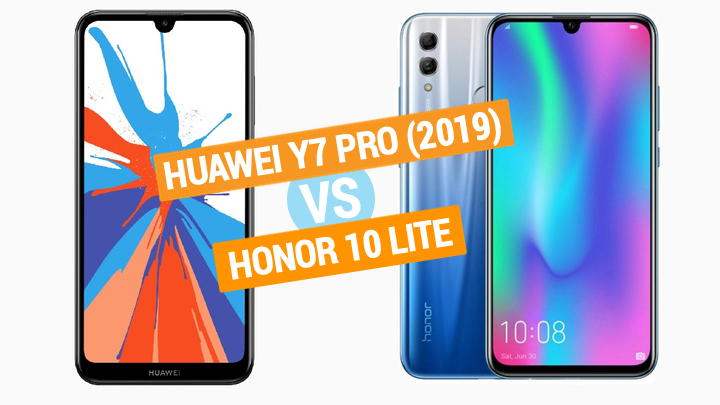 The post Huawei Y7 Pro (2019) vs Honor 10 Lite specs comparison appeared first on YugaTech | Philippines Tech News & Reviews.